This model represents a mid-production M4A1 with the monobloc transmission armor, without direct vision blocs and with the small hatches for the driver and radio-operator/MG gunner. The turret, equipped with a 75mm gun, is of the « low bustle » type, without the hatch for the loader, but with a cartridge evacuation hatch on the left side. While other modelers have qualified this kit as mediocre, I don't share this opinion, when taking the overall quality of the model into account. 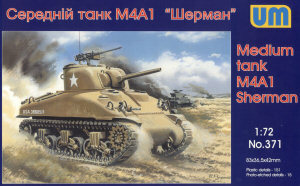 Surely, this model has its defects, but no Sherman kit is flawless and this one is not worse than any other. 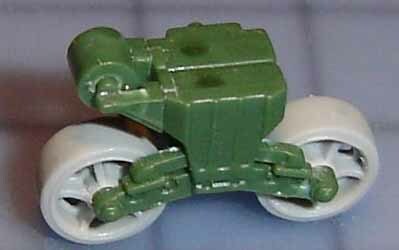 The suspension is very well done and two types of roadwheels are provided. Nevertheless, the latter are not the best aspect of this kit. For instance, the open spoked wheels have six spokes instead of five and are thus unusable. It would be better to replace them with those from Trumpeter's M4A1 kit. According to Doug Chaltry's article the hard plastic chevroned tracks (of an uncertain pattern) are too narrow, but I haven't verified this particular issue. UM provides a small PE fret for the track supports, headlight protectors and other details. Aids are provided to shape these items, which is an example for other manufacturers. 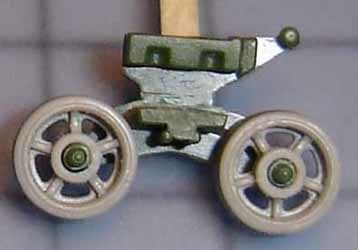 I have replaced the open roadwheels with these from Trumpeter's kit. The central opening is enlarged to allow the axes to fit. The suspension springs (pieces 43A) are very difficult to cut from the sprues without damaging them; a new cutter blade and some careful sanding wil be necessary. As these parts are very small, this is not the fun part of this kit's assembly. 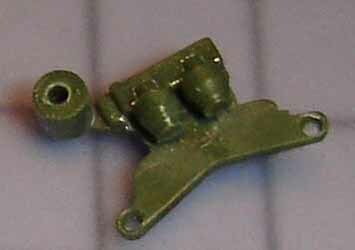 The springs are glued on the indicated spots on the inside of the bogies (pieces 8A et 19A) and left to dry thoroughly. When mating the outside of the bogies (pieces 7A and 18A) to the inner sides, one notices that the assembly is not straightforward. The locating pins for the springs have to be cut back a little (pieces 7A and18A) and the opening for the return rollers has to be widened a bit (piece 6A) before gluing them to the suspension arms (pieces 7A and 18A). The open idlers come from Trumpeter, the drive sprockets are from UM (carefully detached from the sprues with a new knife blade and cleaned up with sanding paper). The support skids for the tracks are in PE and can be bent with the aid of a shaped piece provided by the manufacturer. This process faithfully represents these elements in 1/72 and after all these steps we have obtained an open-spoke suspension that is completely satisfactory. The total width of the tracks, with extensions, appears correct. The problem is more likely situated in the dimension of the inner part of the track-links. 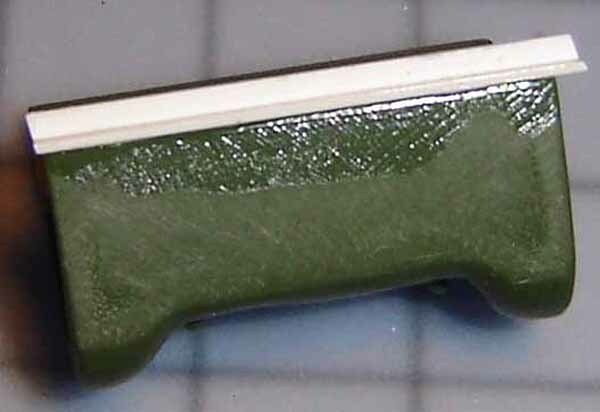 The German company Modelltrans proposes in its catalogue a resin set of T-51 style tracks (plain rubber block). I used these on the kit. Moulded in several parts, the assembly demands care and patience to get all pieces correctly aligned. 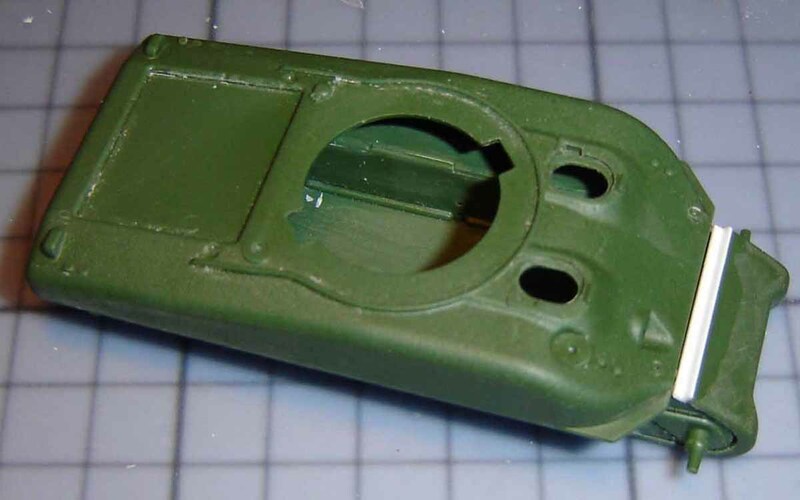 De connection between the hull and transmission cover shows a significant gap that requires plasticard and putty to rectify (see pictures). This is really the only negative point about this kit, without actually being an irremediable defect for a modeler with some experience. The PE part for the bolted connection between hull and transmission cover was cut from its sprue with caution and carefully filed on the edges. This part was glued with CA glue between hull and transmission cover. 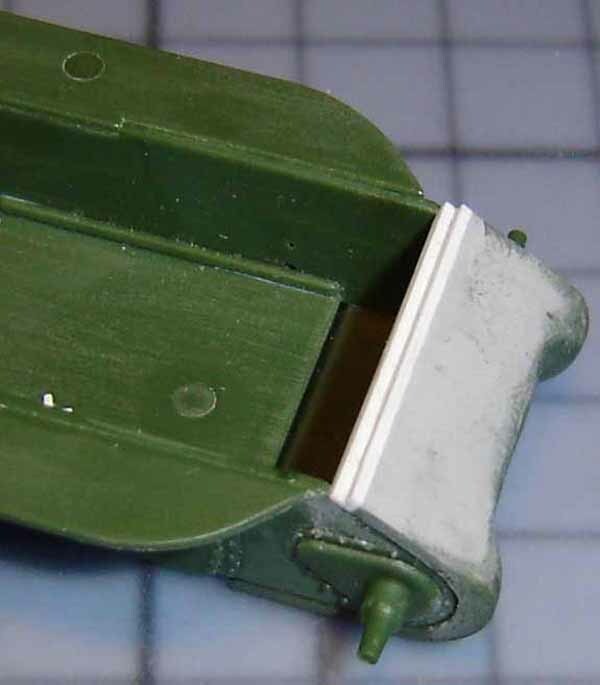 The hatches for driver and radio-operator/MG-gunner are open in the kit, which allows the placement of crew members. If you do so you would need some plasticard on the inside of the hull to blank off these compartments and avoid a see-through effect. The construction of the turret poses no major problems. UM proposes three types of mantlet for the 75mm gun. The mid-production M34A1 model was retained.